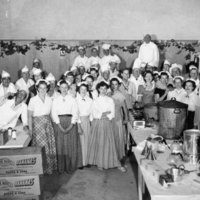 Group of thirty-eight men and women wearing food service clothing, in kitchen area of Mariposa fairgrounds building, Mariposa, Calif.; during Mariposa Centennial celebration, 1952. 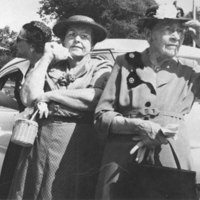 Tags: Clothing & dress -- 1950-1960, Mariposa County (Calif.) -- History, Mariposa County (Calif.) -- Photographs, Mariposa, Calif.
Amelia Williams and Jennie Gagliardo standing beside automobile, 1950s; left to right, unidentified woman, Josephine Olcus, Amelia Williams, and Jennie Gagliardo. 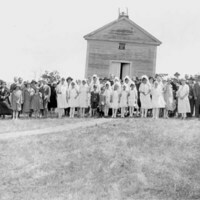 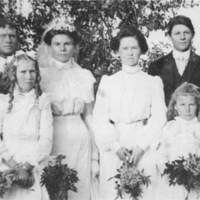 Outdoor wedding party portrait taken at the wedding of Garfield Carter and Margaretha Evert, 1900; left to right, Garfield Carter, Margaretha Evert Carter, Della Carter, Pete Evert, and May Stratman, one of the flower girls. 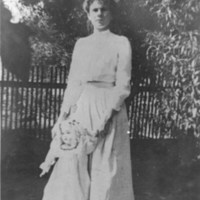 Margaretha Evert, later known as Mother Carter, on her 16th birthday in Lancaster, Calif., holding her birthday present, a large doll; born in Luxembourg in 1884, she came to America in 1888. 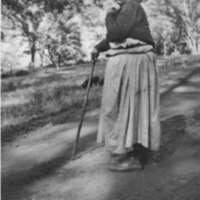 Unidentified Miwok Indian woman standing on roadway, with two small pigs grazing in nearby meadow; near Midpines, Calif., 1930. 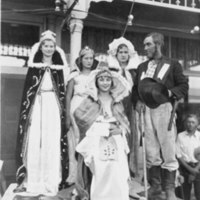 Queen of Mariposa and others on decorated platform in front of hotel on Main Street, during '49 Fiesta celebration, Mariposa, Calif., circa 1931; left to right, Pearl Carter, unidentified girl, Kay Dexter, Abbott Otto, and Dorothy Apperson, seated. 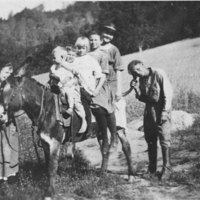 Tags: Main Street, Mariposa (Calif.) -- Buildings, structures, etc., Mariposa County (Calif.) -- Biography, Mariposa County (Calif.) -- History, Mariposa County (Calif.) -- Photographs, Mariposa, Calif. 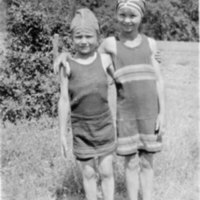 Brother and sister Pete and Pearl Carter wearing bathing suits, standing in meadow near Carter Road, Mariposa, Calif., 1924. 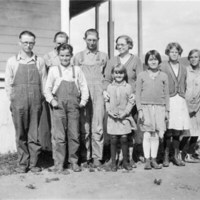 Tags: Carter Road, Mariposa County (Calif.) -- History, Mariposa County (Calif.) -- Photographs, Mariposa, Calif.